'Boring' Singapore City Photo: Tossing up food, high, higher in the air! This was taken yesterday, our office had our annual chinese new year celebration lunch. 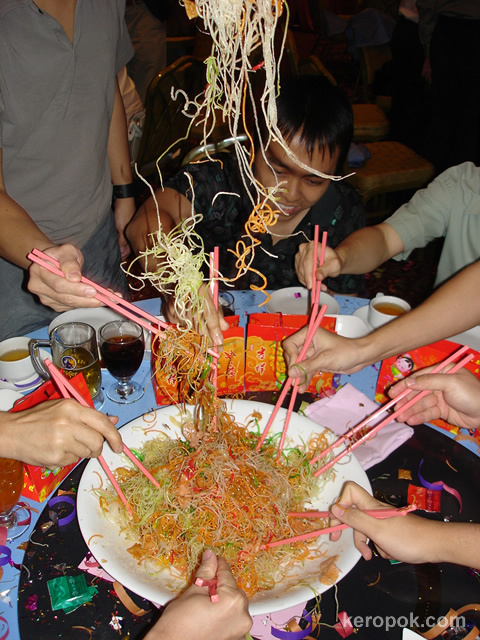 The first dish in most 'eating gatherings' during this season is called 'Yee Sang'. The fun part is to toss it high up in the air before eating it. At the same time, you are suppose to shout out auspicious chinese proverbs. Oh, what a mess we have created! More of these pictures and description at my food site. 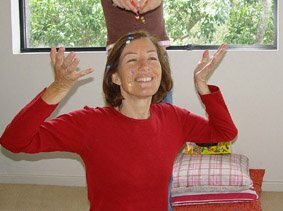 wow, it looks like fun, great celebration Keropok. I'll not be showing this photo to our 3-year old....! Looks like a lot of fun though! It is like being a kid again with noodles in the hair! Hope you have a auspicious year. Hope the room had a high ceiling. :-) Nice shot! jazzy, it more fun playing then eating! haha..
chris & deb, when you little one mess up their food, remember most adults in singapore mess up their food too! felicia, wanna try tossing food too? walter, yes it was very high. we did not toss it too high, coz we wanted to eat the food too. lisi, come to singapore and try or maybe this dish might reach HK shores too! we said all the words in the list provided to us. hehe. Keropok, I love chinese food (in China and in Singapore I noticed I was the only European enjoying with noodle at breakfast. Lol). Unfortunately I don't know Yee Sang. I'll be very happy to taste it next time I'll come. Is it served along all the year or in special occasion only? Thanks for coming to my party today!